Looking for my lady paramore Creative soul seeking fun friend. Fun, Quirky, Creative Explorer seeking similar soul. Honesty, bravery, and a sense of humor a MUST! Does icrad belong in this group? I'm a colorful person who will open your heart. I'm a talented expressionist artist . love anyone or anything distinct,different, or just plain weird. Looking for anyone to do cultural s--- together, laugh together, have fun ,eat good food, or just talk. Does milkymilkymilk belong in this group? Does mick22841 belong in this group? Does loverstragedy belong in this group? 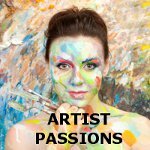 I am an artist I paint with oils, mainly Gothic or dark and brooding themes, angels and architecture. Does chriswilson1970 belong in this group?